Typical process recorders accept analog dc voltage inputs, thermocouple, or RTD temperature inputs or dry contact status input. Math functions: +, -, x, ÷, square root, absolute value, logarithm, exponential functions, max, min, time average, group average, summantion, (maxmin), standard deviation, and integration. RS-232C: serial point to point, 50 feet cable length maximum at 9600 baud; GPIB (IEEE-488): parallel (20 meter system cable length maximum, 2 meter distance between devices, up to 14 devices per controller); RS-422A/RS-485: Balanced/unbalanced, serial, up to 32 devices per system, cable length can extend to 1.2 km at 9600 baud. 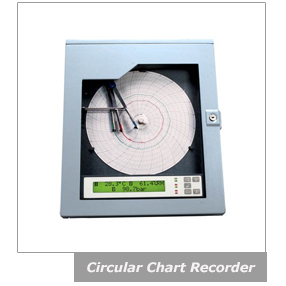 Hybrid Recorder: A recorder that combines analog trend representation and digital measured value printing on the same chart paper, without disruption of trend printing. Servo Balancing: A means of positioning the pen of a drag pen recorder. Null-balance operation has no current flow at balance, nullifying the effect of lead resistance. Conventional servo balancing recorders use contact mechanisms in the feedback loop and brushes in the servo motor. New technology allows the use of a noncontact pen positioning transducer and a brushless dc servo motor. Scanning Recorder: A multi-point recorder that scans all of its inputs to obtain new measured data every set time period (usually 2 to 6 seconds). Printing for all points is often performed during each cycle of the printing mechanism. Multi-color Printing: A recorder that records trend traces in more than one color to make traces easier to differentiate. Drag pen recorders use a different color for each pen (usually four pens maximum). Mulit-point recorders typically record in six colors. Linear Scaling: Recording of a voltage input in terms of the engineering variable, such as temperature, that the voltage represents. Transformation is Y (variable to be recorded) = mX (slope x input signal) + b (Y intercept). Pen Offset Compensation: In traditional multiple input drag pen recorders, each pen can travel the full width of the recording chart. In order to do so, the pens must be physically offset from one another. This puts the different pen traces on different time lines of the chart. By placing the measured data of the front-most pen(s) into a buffer and delaying their printing, the traces can be synchronized to the same time line, thereby compensating for their offset. Accuracy: The closeness to the actual signal that the measured value or trend position takes, stated as either a percentage of full scale or percent of reading. Separate accuracy statements are typically provided for measuring and recording functions. Tag ID: A means of designating a trace or digital measured value by an alphanumeric identifier instead of a numeric identifier. Typically available with up to seven characters. Digital Printing: Printing of the precise measured numerical values for the various channels, along with their channel identifiers. Digital printing usually occurs in a margin of the chart so as not to interrupt trend recording. Log Report: A printout of precise measured numerical values for the various channels, along with their channel identifiers. Typically prints in full character height per print cycle. During trending, prints on demand, resuming trending automatically. When trending is not being used, prints at a preselected time interval. May also include alarm status indication. Can I send my 4-20 mA control output to a chart recorder to monitor a process input? No. A control output is designed to control a valve or some equivalent control device. If you need to send an analog signal to a recording device, then choose a controller that has a “retransmission or recorder output” option.